I don’t think Keynesians should be arguing that lower real interest rates are the key to recovery. A bold and credible monetary stimulus that was expected to produce much faster NGDP growth might well raise long term risk-free interest rates. According to Duy, the Keynesian view is that an increase in expected inflation will shift the IS curve to the right and increase the (nominal) interest rate. However, he recognizes that if the Fed commits to increasing nominal expenditure, this will improve "confidence" also shifting the IS curve to the right. Rather than show nominal interest rates on the vertical axis, an alternative approach shows real interest rates. While there is no zero bound on real interest rates, the zero nominal bound shows as a horizontal LM curve at a real interest rate equal to the negative of the expected inflation rate. The real market interest rate is at r1, the negative of the inflation rate. It crosses the IS curve at y1, leaving real income below potential income, yp. 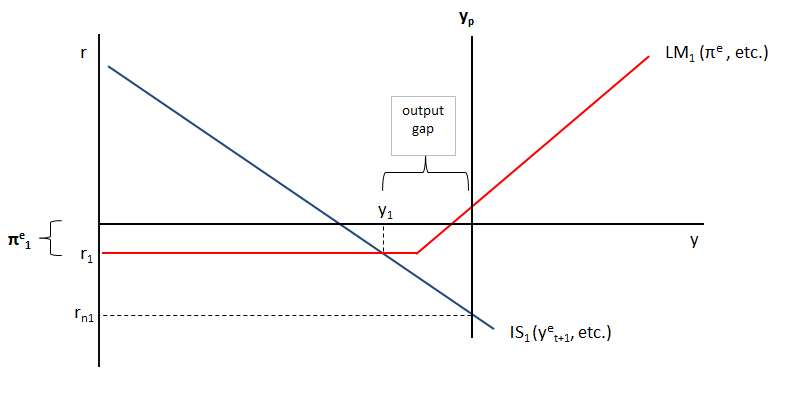 The result is an output gap. The natural interest rate, rn is well bellow the real market interest rate. At that interest rate, the IS curve shows a level of real expenditure equal to potential income. The way market monetarists see it, Keynesians propose creating sufficient expected inflation so that the real interest rate will fall to the natural interest rate. The LM curve shifts down and to the right. (The increase in expected inflation shifts it down, and the real quantity of money expands to shift it to the right. ) The nominal interest rate, stays equal to zero. This will move along an unchanged IS curve, raising real expenditure until it equals potential income, closing the output gap. Market monetarists instead favor an increase in expected nominal expenditure. While this could result in higher expected inflation and a lower real interest rate as above, it will also result in higher real income and output. By increasing future real income and output, this results in increased real expenditure now, shifting the IS curve to the right. In this case, the real interest rate rises above zero to the new natural interest rate, rn2. Real expenditure and real income both rise, to the potential income, closing the output gap. The nominal interest rate was zero, and now rises above the natural interest rate by the unchanged expected inflation rate. From a market monetarist perspective, this is the preferred result. Increasing expected inflation and lowering real interest rates is not in any sense a goal. Unfortunately, the increase in expected nominal GDP might in fact cause an increase in expected inflation. If this were to occur, the result would be intermediate. The IS curve shifts to the right because of expectations of increased real income and output, and the LM curve shifts down and to the right, because of an increase in expected inflation. With this intermediate scenario, the real interest rate might fall, but it might rise. 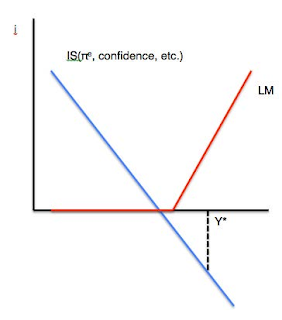 In this scenario, the expected inflation rate increases, shifting the LM curve down. The IS curve shifts to the right because of the increase in expected future real income and output. The natural interest rate rises to a positive level and the real market interest rate rises to that same level. The nominal interest rate rises above the new, natural interest rate by the new, higher expected inflation rate. 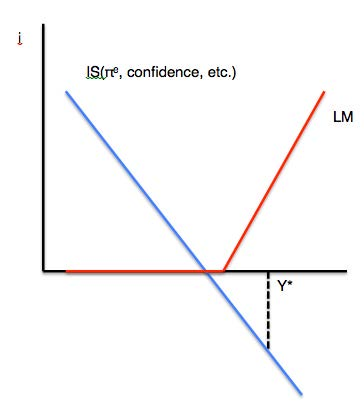 This diagram represents a scenario where the expected inflation rate inceases, so the LM curve shifts down. The IS curve shifts to the right because of an increase in expected real income and output. The natural interest rate remains negative, but it is much higher than its initial level. The real maket interest rate has risen to this new, higher natural interest rate. The nominal interest rate, which was zero, is now positive, shown as R2. Again, the increase in the expected inflation rate was not needed. In this scenario, the expected inflation rate rises, and the LM cuve shifts down (and to the right.) The IS curve again shifts to the right due to the increase in expected real income and output. The natural interest rate does rise to the new, more negative market real interest rate. The only differrence from the "Keynesisan" scenario above, is that the expected inflation rate rose by less. So, while a smaller increase in expected inflation was necessary, because of the small impact of expected future income and output on current real expenditures, some increase was necessary to bring the real interest rate down to a now higher natural interest rate. An increase in expected inflation was necessary to close the output gap. The nominal interest rate remains zero. Which of these scenarios is more realistic? Market monetarists argue that it is unnecessary to choose, and that instead the sole goal should be an increase in nominal spending on output. If the better scenarios actually occur, then nominal interest rates should be allowed to rise, and we should be pleased that the recovery occured with no increase in expected (or, hopefully, actual) inflation. On the other hand, if the increase in nominal spending on output generates higher expected inflation, and this reduces real market interest rates, then so be it. But the goal is not higher expected inflation and lower real interest rates. 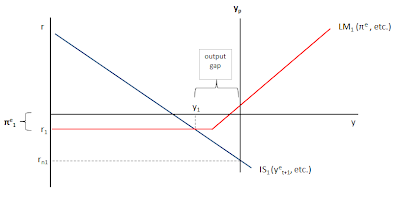 The goal is to close the output gap, so that real income equals potential income and the real market interest rate equals the natural interest rate. Forget about inflation, especially now. Forget about real or nominal interest rates. You have the Fed, and you have to increase real GDP by 5 percent a year for the next four years. What would you do? You would print boatloads of money. We have to be very careful with all these things since that’s how we can make money or even lose it. If we are not sure about things then we can end up losing badly, so that’s where we have to be extremely careful with everything. I always follow any major news or updates easily with help of OctaFX broker due to their highly qualified team of experts pulling out great reports of the whole market direction and following this leads to fairy tale results. Hamilton: Should the Fed Do More?